europa skin care: Age Spots : Is There Anything I Can Do To Remove Them? Age Spots : Is There Anything I Can Do To Remove Them? Age spots are irregular brown or red blotchy, irregular pigmented areas that occur over time and with exposure to the sun and elements. They can arise at any age, and tend to increase in size and color as they progress. They are also one of the main signs of aging on the skin. Once you develop age spots there are certain treatments that can help improve their appearance and help them to fade. You can come to the dermatologist's office and we can give you topical medicines that contain an acid called tretinoin or that contain vitamin C and E, used in combination. Also, in the dermatologist's office we can treat your age spots with a product we call liquid nitrogen. This is a light, freezing process that helps the pigment normalize. There are certain lasers that we use in the dermatology office that can help improve the appearance of age spots, and there are chemical peels which are mild that can also do the same. With regards to age spots I like to tell my patients that prevention is worth a pound of cure and that prevention is actually the best treatment for age spot development. This includes using a sunscreen when outdoors and trying to avoid ultraviolet light. If you're concerned about vitamin D supplementation, simply do so in a well-rounded diet or with a vitamin. And, of course, smoking is bad for your overall health, but it's also very important for the health of your skin. And it also accelerates photoaging -- so please don't smoke and also try to avoid second- and third-hand smoke when possible. Medications. Prescription bleaching creams (hydroquinone) used alone or with retinoids (tretinoin) and a mild steroid may gradually fade the spots over several months. Sun protection with a broad-spectrum sunscreen with a sun protection factor (SPF) of 30 is strongly advised if you use medication treatments. The treatments may result in temporary itching, redness, burning or dryness. Laser therapy. Laser therapy destroys melanin-producing cells (melanocytes) without damaging the skin's surface. Treatments with a laser typically require several sessions. 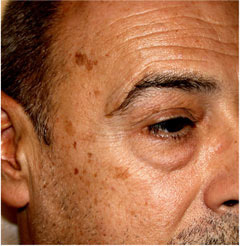 After treatment, age spots fade gradually over several weeks or months. Laser therapy has few side effects, but it may result in slight discoloration of the skin. Chemical peel. A chemical peel involves applying an acid, which burns the outer layer of your skin, to the age spots. As your skin peels, new skin forms to take its place. Several treatments may be necessary before you notice any results. Sun protection is strongly advised following this treatment. Temporary irritation is likely, and there's a slight risk of discoloration.